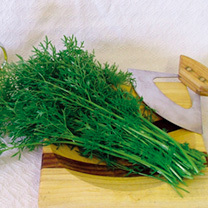 An improved tasty, slow to bolt herb which can be grown as a cut-&-come-again leaf salad or a mature plant. Sow monthly for a continuous supply; crop into the winter with cloche protection. HA - Hardy annual. Simon says: "Not as strong or pungent as ordinary coriander, so you can use more. Mix through leaf salads to give them a boost."